The only official airport hotel Novotel Bangkok Airport offers 612 rooms and suites, designed with an intriguing Thai influence and a complete understanding of guests’ needs. Only Novotel is situated right next to the airport terminal. A leisurely 5 minutes stroll via the air-conditioned underground walkway or a short ride in the 24 h complimentary airport shuttle van service from gate 4, arrival level, at the terminal and access the hotel with an abundance of facilities, 8 restaurants and bars, international brand VOUS Spa, swimming pool surrounded in tropical gardens with pool bar, well equipped fitness centre with sauna and steam-room, business center with secretarial services and various meeting-rooms for conferences and weddings for up to 1,000 persons. 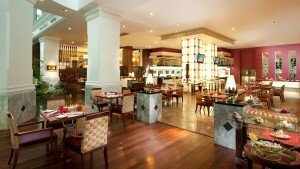 “24 Hours Flexi” and “Flexi Meal” reflect the hotel’s commitment to guests’ convenience. 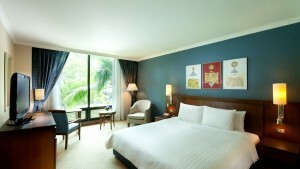 “Time is Yours” at Novotel Bangkok Airport! Discover how to skip over Bangkok’s traffic to city center with all its shopping in just a 23 minutes trip via the speedy Airport Rail Link. The hotel’s commitment to social and environmental responsibility are visibly seen with eco friendly practices and conveniences provided to disabled guests. All guestrooms are non-smoking. The hotel provides designated areas for smoking. Novotel Bangkok Suvarnabhumi Airport Hotel has been awarded by Business Traveller Asia Pacific magazine as one of the top three Best Airport Hotels in Asia Pacific.